Regular Briefings on District Issues and Topics – These are briefing meetings or trustee workshops (different Boards have different names for the meetings). We regularly schedule time for the superintendent and members of the District Leadership Team to in-service trustees on issues and topics. These are not decision-making sessions; rather, these meetings are an occasion to ensure trustees have a like understanding on any particular topic. While the meetings can occur anytime during the year, we do reserve time prior to public Board meetings for these important sessions. Clear Processes – Nothing can be less helpful than a muddy process. For trustees to make a thoughtful, informed decision there must be a clear process and inclusive of the community. This is an area where the superintendent can provide important guidance. As an example, say a teacher, parent, trustee or community member wants to start a new program in the district. We have a very clear Choice Consultative Committee process to guide us through and to ensure the good ideas are thought through, planned and come to fruition. 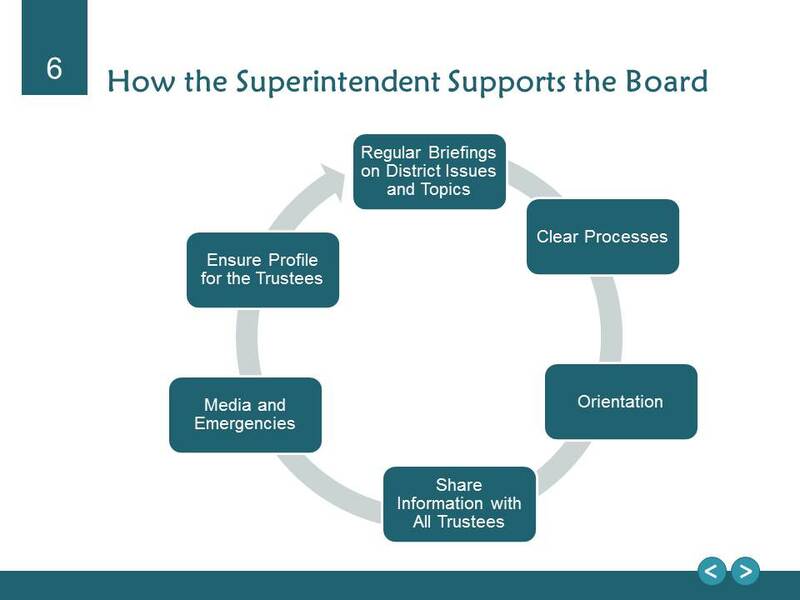 Orientation – Trustee orientation is built into policy in our school district. Elections are held in November, and the period up to spring break is taken to focus on orientation for all trustees. Again, it is important for all trustees to have a like understanding of all information. So, we have built a “101” series, like a set of first-year university introductory courses. Each week, trustees will work with staff on learning an understanding a different aspect of the organization. Areas include: working with the superintendent, budget and finance, human resources and bargaining, curriculum and provincial learning directions, Aboriginal education, Student Support Services, International Programs and Facilities. Share Information with All Trustees – When a trustee asks the superintendent a general question via email, I respond to all trustees. It is symbolic about how we work together. If it is a question for one trustee, it is likely a question for all. Media and Emergencies – We are clear about who will be the spokesperson for different issues and also ensure we have consistency and clarity in our messaging to staff and the community. In our context, the superintendent is most often the spokesperson and will loop in the Board Chair on any emerging and media topics. Ensure Profile for the Trustees – West Vancouver is a community with an outstanding public education system and with strong independent schools. It is crucial the public education story stays front and centre in our community. The superintendent can work to ensure that the important work and leadership of trustees are highlighted at community events and in local newspapers. 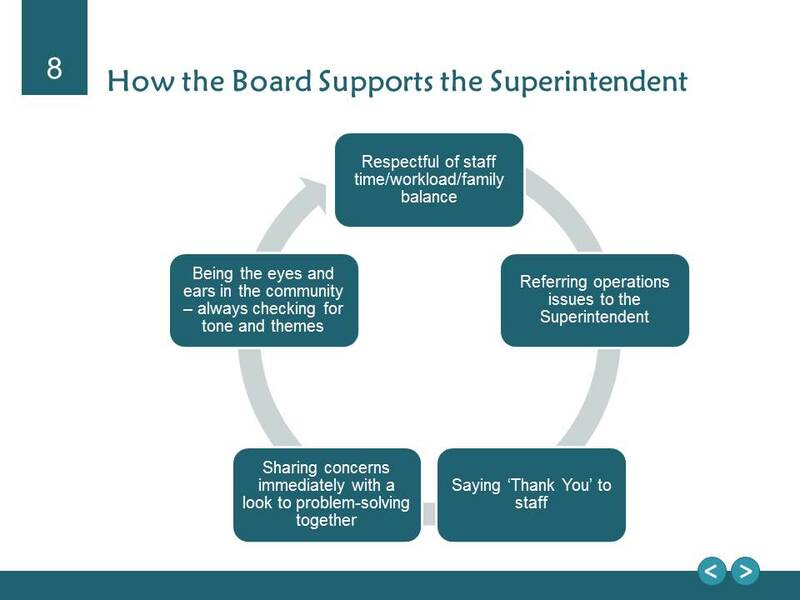 Respectful of Staff Time and Work/Family Balance – Our Board has been very respectful to the fact that most staff in district leadership positions have young families. If the superintendent needs to attend an event with trustees, there are no expectations that senior staff must attend as well. Trustees and staff look at the calendar of community events and share responsibilities — not, all trying to attend all events. Also, the Board has moved to a mix of daytime/evening committee and Board meetings to allow for a better balance regarding work commitments. Referring operations issues to the Superintendent – Often, when a trustee receives an email that is individually addressed to them, all trustees will have received the same email, as has the superintendent and others. When an issue comes in that is clearly operational, by policy, trustees immediately include the superintendent and a plan is made as to who is the most appropriate person to respond. Saying “Thank You” to Staff – From Board highlights of staff accomplishments, to a staff Christmas party (more than 200 staff members attended a district party in early December), to an annual retirement gathering, the Board continually works to acknowledge all staff — teachers, administrators and support staff, because this makes a huge difference in fostering the family type climate and culture in our schools and district. Our Board Chair will regularly write dozens of notes and send regular emails recognizing the work of staff. Sharing concerns immediately with a Look to Problem-solving Together – When there is a problem or concern, one can either look to someone to blame, or work together to find a solution. In my eight years in West Vancouver, the latter has been the focus. Whether it is a tricky issue like budget reductions, or the process of specialty programs, or facility initiatives that have multiple stakeholders, trustees have worked with staff to find problem-solving solutions. Being the eyes and ears in the community – We are always checking for tone and themes because trustees have a unique position in the community and district. They can be in a supermarket, on a soccer field, walking on the seawall, but they often receive ongoing and often unsolicited feedback about how we are doing in our schools. And, it is tricky to know what to do with this information. Again, in my eight years with the district, the trustees have not looked to draw immediate conclusions from what they hear, but do share the information with the superintendent, not necessarily out of a need for action, but to assist the superintendent in their job — clear information is always a good thing. Again, it is important to give a similar caveat that I gave in my earlier post on Board governance. This is hardly an exhaustive list of the Board’s work, but is intended to highlight some small things that can make a big difference. It is also important to reaffirm there are many ‘right ways’ to go about Board governance and the model we have built is one. Finally, our model is an ongoing work in progress as we continually look to be better.